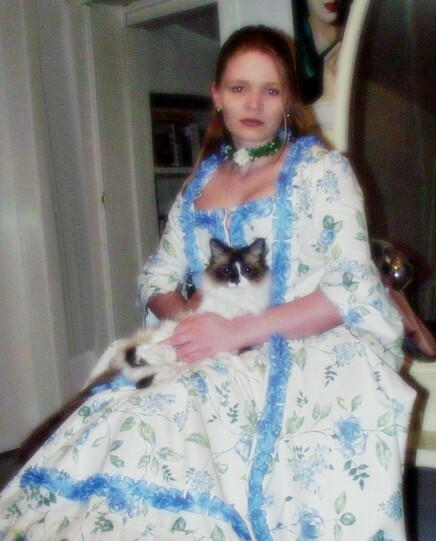 Even if my favorite periods are Elizabethan and Victorian, I still find quite a lot of fashions from other periods nice, too (Just look at my list of planned costumes to see proof for this statement!). 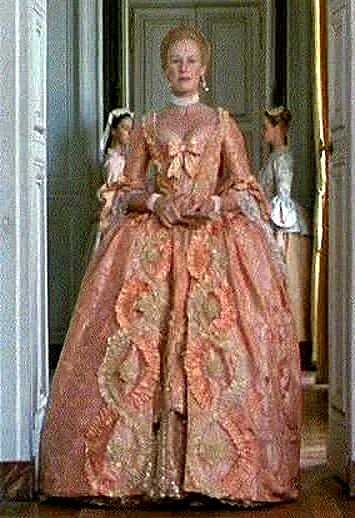 Such as, for example, the Robe à la française, which was worn around 1750. Back then, I had a *very* nice fabric for that gown (which I, by the way, later sold on Ebay) – but there were many, many construction mistakes in the gown which I today wouldn’t make any more. 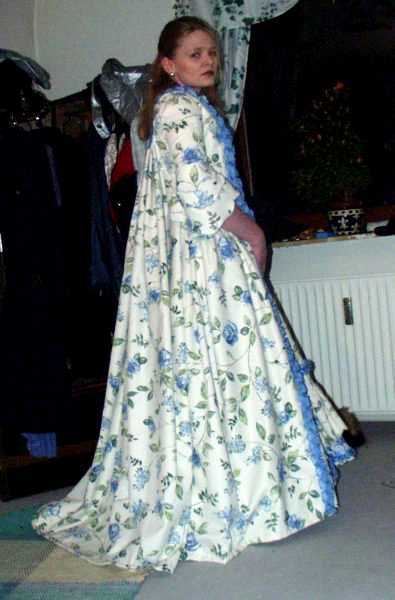 For example, I enlarged the pattern for the gown the wrong way, so that the whole dress is too short – this is especially *very* visible on the petticoat, which is for good reason hidden in almost all pictures – and in the one in which it is visible to the floor, I must admit that I’ve slightly bend my knees so that the hem would be closer to the floor…. Another indication for the pattern being ‘too short’ is that the neckline is not deep enough (I pulled it down almost violently for the pretty picture with my cat). I didn’t enlarge the sleeve flounces to the correct size, which is why they’re slightly too small. The compère is not stiffened. The upper sleeves were *far* too tight – I swear that my fingers were tingling from the decreased blood pressure in my arms… bending my arm was almost impossible. And last not least – I’m wearing modern underwear with the gown in the pictures. 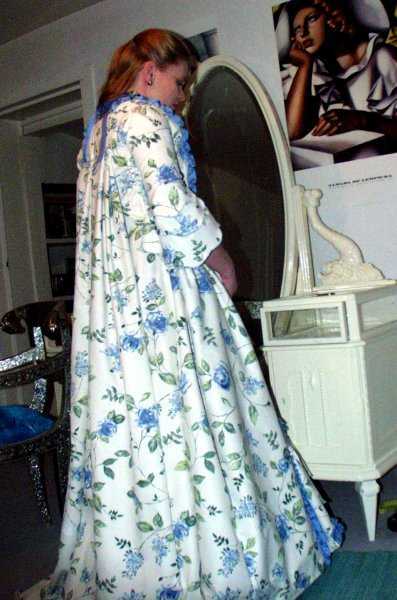 Robe à la française-fans – you’ll probably cringe if I tell you that I’m wearing a modern A-shaped bridal hoopskirt instead of pocket hoops with the gown in the pictures. Well – that just proves that we’re all not born with our costuming knowledge, and that time and experience helps to recognize what one did wrong the last time, right? 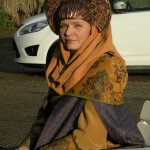 Yes, the fabric was beautiful – and I’m terribly sad that I can’t get more of it. However, washing my way through my collection of fabrics (which I do every few years to prevent the dust from completely settling in), I found thirteen yards of a fabric which I had almost forgotten. I’ve bought it some years ago (in 2000, I think) on Ebay. The fabric is a very soft feeling, yet slightly crisp draping fine ivory cotton, which is printed with fine stripes of geometrical designs in pink/wine and moss/dark green. It’s a very beautiful fabric, and the fact that it is just 28 inch / 72cm wide doesn’t help me much in figuring out what it could originally been used for. I also have no idea how old it really is – it was sold on Ebay as ‘vintage’, which can mean a lot. From the pattern and the condition of the fabric when I got it, I would date it to c. 1910; but from the overall condition after washing, it can’t be much older than 20 years… it’s a bit difficult to date. Lately I saw some Art deco cotton prints from the 1920s and think this could also be one. Each of the stripes is about 1” wide, if that helps with estimating the size? However, as I only had 13 yards of my not very wide fabric, I had to plan my cutting very carefully. decorate the overdress with pleated organdy strips – while the usual Robe à la française was trimmed with pinked strips of dress fabric, I just can’t afford that, as I don’t have enough of the fabric; but some images show Françaises that were trimmed with organza or lace instead of fabric. I first had planned to use velvet trims for the decoration (in deep green and wine red), but couldn’t find any pictorial evidence for velvet trimmings, so I chose organza. The compère (front) as well as the petticoat will be made of ivory taffeta, the petticoat decorated with one wide strip of the overdress fabric and two more strips of ruffled lace. I have by no means enough of my printed fabric to even just fake the front of a petticoat from the same fabric as the overdress (which feel terribly sorry about). 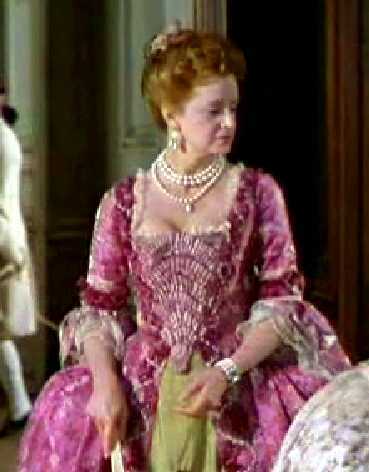 Of course, this time I will wear period underwear with my dress – a chemise, Rococo stays and pocket hoops. As I’ve already made those three items for my planned ‘Pirates’ golden gown, I’ll just use them for this gown as well- as already mentioned, Baroque / Rococo is not my favorite period (and will probably never become one of my favorites, even if it’s still more, shall we say, acceptable for me than, for example, Regency), and I see no reason in making yet another set of undergarments if the ones from a different project will also do. The work on that gown went far quicker than I had expected – in just one day, I had finished the basic Francaise (without the petticoat and compères, though). This is what it looked like when pinned to my dressmaking mannequin (underneath is the underdress for my Visitation costume – yes, I am making several costumes at once and don’t necessarily mind taking them off the mannequin, thanks for asking…) and, of course, with pocket hoops. The last picture shows the pleated organdy and rococo braid trims with which I have decorated the gown in a close-up. These pictures also made me think that perhaps a dark red petticoat and compères or stomacher would also work very well for the gown. I think it looks great so far, even if it’s not hemmed yet and many parts are still missing. and took about another day to make. The strips are made from box pleated organdy and are then furthermore decorated with Rococo braid. …and an extra’s petticoat from the same movie which was displayed together with the corresponding Francaise at the touring costume exhibit, of which Costumersguide has some very nice and clear photographs; look at this page, browse through the pages of the exhibit and note the red-silver patterned gown from Dangerous Liaisons with the petticoat that has some kind of circular / spiral decoration on it. It’s very clearly visible on the exhibit flyer on the right at the top of the page. At some point of time I ran out of organdy *and* am close to running out of rococo braid – you can probably see that the spiral on the petticoat is not complete. 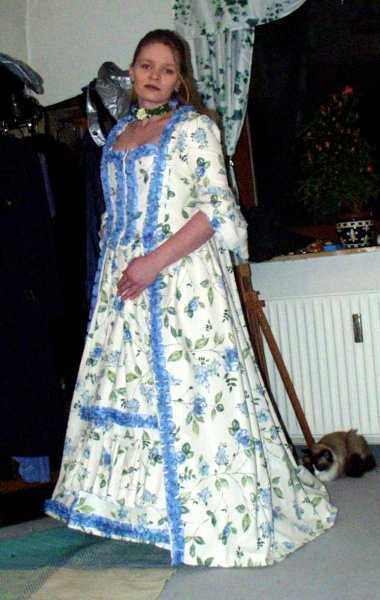 That, by the way, means that at the point of time this picture was taken, I had used 50 meters / about 55 yards of red and green organdy trim and 10 meters / 11 yards of rococo braid on that gown. I’m currently waiting for my supplier to send me some more of each of the three, as I can’t finish the gown as long as I don’t have them. 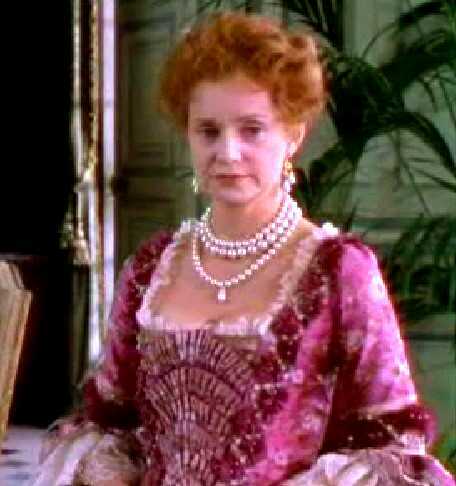 It’s still over my ‘Visitation’ foundation gown; it’s quite practical because the sleeves of that chemise make the Francaise’s sleeves look as if there were actual arms in it. I must say that I’m rather fond of the look of the gown so far; but as long as I don’t have more of that organdy and rococo braid, I can’t finish the decoration.